Are you watching kids scroll through life, with their rapid-fire thumbs and a six-second attention span? Physician and filmmaker Delaney Ruston saw that happening with her own kids and began a quest to uncover how it might impact their development. As with her other two award-winning documentaries on mental health, Ruston takes a deeply personal approach as she probes into the vulnerable corners of family life, including her own, to explore struggles over social media, video games, academics and internet addiction. 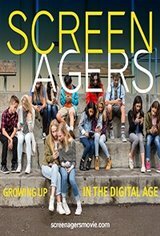 Through poignant, and unexpectedly funny stories, along with surprising insights from authors, psychologists, and brain scientists, SCREENAGERS reveals how tech time impacts kids' development and also offers solutions on how adults can empower their kids to best navigate the digital world to find balance.